JUVEDERM fillers are injectable gels made from modified hyaluronic acid (HA); a complex sugar naturally found in the human body. HA helps the skin retain moisture and softness. Fine needles are used to inject gel into the skin, and each injection contains lidocaine anesthetic to reduce discomfort and replaces volume loss. 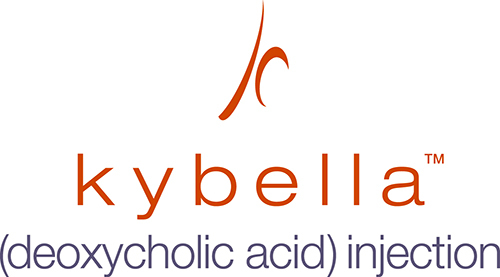 KYBELLA is a NEW technology prescription, using a naturally occurring molecule for adults to minimize the appearance of the stubborn “double chin”. Revealing a more contoured, chiseled jawline, and youthful shape to the face. When injected into the fat beneath your chin, KYBELLA breaks down fat cells in the area forever! Once destroyed, those cells are gradually flushed out and cleared from the treatment area through your body’s natural metabolism. Takes 2 – 4 treatments every 6-8 weeks to see optimal results.